“Spahn and Sain and Pray for Rain” was the battle cry of the 1948 Boston Braves. Johnny Sain was born to a trivia answer. Last pitcher to face Babe Ruth, first pitcher to face Jackie Robinson, half of one of baseball’s most famous phrases, last man to coach a 30-game winner. 1. Sain began his career in 1942, and finished with a 4-7 record with the Boston Braves. He then entered the service, and did not resume pitching in the major leagues until 1946. 2. Sain threw the last pitch to Babe Ruth in an organized game. During World War II, Sain was a Navy aviator and pitched for a military team that included Ted Williams and other big leaguers. On July 28, 1943, his team played an exhibition game at Yankee Stadium against a group of major leaguers managed by Babe Ruth. Sain walked the Babe, who was then 48 years old. 3. Sain threw the first pitch in the major leagues to Jackie Robinson on April 15, 1947, at Ebbets Field in Brooklyn. Robinson grounded out to shortstop, but the Dodgers went on to beat Sain and the Braves, 5-3. 4.Johnny Sain was a four-time, 20-game winner, all with the Boston Braves. He won 20 games three straight times from 1946-48, and won 20 again in 1950. 5. 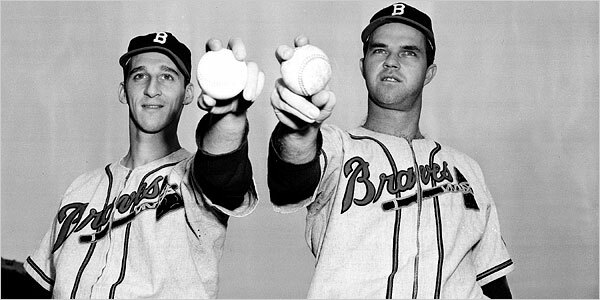 “Spahn and Sain and Pray for Rain” was the battle cry of the 1948 Braves. Boston Post sports editor Gerald V. Hern wrote a poem about the Braves dependence on two starters, Warren Spahn and Johnny Sain. The poem was inspired by the performance of Spahn and Sain during the Braves’ 1948 pennant drive. Boston swept a Labor Day doubleheader, with Spahn throwing a complete 14-inning win in the opener, and Sain pitching a shutout in the second game. Following two off days, it rained. Spahn won the next day, and Sain won the day after that. Three days later, Spahn won, then Sain won the next day. After one more off day, the two pitchers were brought back, and won another doubleheader, combining to go 8-0 over 12 days. 6. The Braves reached the World Series in 1948 for the first time in 34 years. In the opener at Braves Field, Sain pitched a four-hit, 1-0 shutout over Cleveland’s Bob Feller, who allowed only two hits but lost. Sain pitched another complete game but lost to the Indians 2-1 in Game Four. Cleveland won the Series in six games, the last time the Tribe won a World Series. 7. Sain was traded to the Yankees during the 1951 season for Lew Burdette and $50,000. Sain was a member of three World Championship squads in New York. Six years later, Burdette beat the Yankees three times in the 1957 World Series to pitch the Milwaukee Braves to victory and win the MVP. 8. Sain was traded from the Yankees to the Kansas City A’s, along with Hall of Famer Enos Slaughter, for pitcher Sonny Dixon and cash in 1955, and retired shortly after. He finished with a 139-116 career record. 9. That’s the pitching side of the Sain ledger. An outstanding contact hitter, Sain always helped himself with the bat. He had a .245 career average and struck out a mere 20 times in 774 lifetime at-bats. 10. Sain later became a pitching coach with the Yankees, Twins, Tigers, White Sox and Atlanta Braves before retiring in 1986. He coached baseball’s last 30-game winner, Denny McLain. The only time Whitey Ford, Jim Bouton, Mudcat Grant, Earl Wilson, Denny McLain, Wilbur Wood, Stan Bahnsen and Jim Kaat won 20 games, Johnny Sain was their pitching coach. Looking back in time through the eyes of a 10-year-old kid growing up a Yankee fan in New York, I have fond memories of the summer of 1961 and the great home run chase. And this kid remembers July 25, 1961, 50 years later. That was the night the home run chase became real. On 7/25/61, Roger Maris hit four home runs in a twi-night doubleheader at Yankee Stadium, two in each game, to become the fastest player to reach 40 home runs. The fireworks began in the second inning when Maris hit a two-run shot off the right field foul pole off Chicago’s Frank Baumann to tie teammate Mickey Mantle for the home run lead with 37. Mantle immediately broke the tie with a home run off the left field foul pole for his 38th. Mantle was done for the night, but Maris was just warming up. He hit another home run in the eighth inning of the opener against former Yankee Don Larsen, “the imperfect man who pitched the perfect game” and part of the trade that brought Maris to the Yankees prior to the 1960 season. The Bombers won 5-1 as Whitey Ford ran his record to 18-2 and Luis Arroyo recorded his 20th save. In the nightcap, Maris, pictured below, hit a solo shot in the fourth and a three-run blast in the sixth, for his 39th and 40th home runs of the season. Elston Howard also homered in the second game and Clete Boyer homered twice as the Yanks won 12-0 behind the shutout pitching of Bill Stafford. The sweep edged the Yankees a half-game ahead of the Detroit Tigers. Maris finished the day with four home runs and eight RBIs. Mantle would retake the home run lead in early August before Maris got hot again. Roger passed the Mick for good when he blasted his 46th home run of the year – against the White Sox — on August 15. Mantle wound up with a career high 54 home runs that season, his body breaking down over the final weeks of the season. Maris broke Babe Ruth’s single season home run record of 60, set in 1927, with his 61st home run against the Boston Red Sox on the final day of the season. Nearly 50 years later, Maris (162 games) and Ruth (154 games) continue to hold the American League single season record. And if you discount the steroid-juiced and hyper-inflated home run marks of Barry Bonds, Mark McGwire and Sammy Sosa, Roger Maris is still baseball’s all-time single season home run king. With his next hit, Derek Jeter will pass Al Kaline for 26th place on the all-time hit list. DJ will be passing plenty more signposts in the 3,000 hit club over the course of this season and the ensuring years. Wade Boggs is next on the list with 3,010. In fact, if DJ stays healthy and plays out his current contract with the Yankees (two years left after this season with a player option for a third year), there’s a good chance he’ll wind up with 3,500 hits. That’s rarefied air. Only five players — Pete Rose (4,256), Ty Cobb (4,189), Hank Aaron (3,771), Stan Musial (3,630), and Tris Speaker (3,514) — have more. Do the math. With 3,007 hits and 90 games remaining, Jeter should compile the 50 plus hits it would need to pass Craig Biggio, currently 20th on the hit list with 3,060, by the end of the year. And if Jeter averages 150 hits a season for the next three years, that would put him past 3,500. Jeter has averaged nearly 195 hits for his 15 full seasons in the majors. He’s slowing down, but 150 hits a year is a reasonable assumption. Heck, just two years ago Jeter had 212 hits, the second highest total of his career. Even last year, admittedly an off season by Jeterian standards, he still managed 179 hits. While most ballplayers don’t have a single signature moment, Derek Jeter has a career full of them. The Yankee captain even has a signature play — the Jeter jump throw from deep shortstop — which he’s performed dozens and dozens of times throughout his 17-year career. Here are 10 signature moments that define Derek Jeter. 1. 1996 — The shortstop comes through in the clutch in his rookie season. His two-out, bases loaded single up the middle delivers the winning run in the 10th inning of a 12-11 Yankee victory over the Red Sox. 2. 1996 — In the game that made Jeffrey Maier famous, Jeter’s eighth-inning home run ties to the score and the Yankees go on to beat the Orioles, 5-4, in Game One of the ALCS. 3. 2000 — Jeter leads off Game 4 of the Subway Series with a first-pitch home run to spark a 3-2 win, then hits another homer in Game 5 to earn the World Series MVP. 4. 2001 — The Flip: From out of nowhere. Jeter catches an errant throw and flips to ball to catcher Jorge Posada to nip Jeremy Giambi at home and preserve a 1-0 Yankee win at Oakland that turned the ALDS. 5. 2001 — With the score tied in the 10th inning, Jeter hits a walk-off home run in Game 4 of the World Series to beat the Arizona Diamondbacks, 4-3, and earn a new nickname — Mr. November. 6. 2004 — Jeter catches a pop fly against Boston and dives into the Yankee Stadium stands. He comes out bruised and bloody, but the Yankees come out a winner in 13 innings. 7. 2005 — With the Red Sox coming off their first World Championship in 86 years, Jeter hits a walk-off home run to beat Boston and closer Keith Foulke, 4-3. in the second game of the season. 8. 2005 — Jeter hits the first — and thus far only — grand slam of his career against the Chicago Cubs in the Bronx, sparking the Yankees to an 8-1 victory. 9. 2009 — Captain Jeter passes Captain Gehrig with a third-inning single to right and becomes the all-time hit leader for the Yankees with 2,722 hits. 10. 2010 — Jeter joins the exclusive 3,000 hit club with a home run, and caps a 5-for-5 day with a game-winning single in the eighth as the Yankees beat Tampa Bay, 5-4. Clutching a home run ball from Derek Jeter, the SportsLifer stands behind home plate at Yankee Stadium. No it wasn’t Jeter’s 3,000th hit, but a BP home run two years ago. Derek Jeter is just the second player in history to make his 3,000th hit a home run. 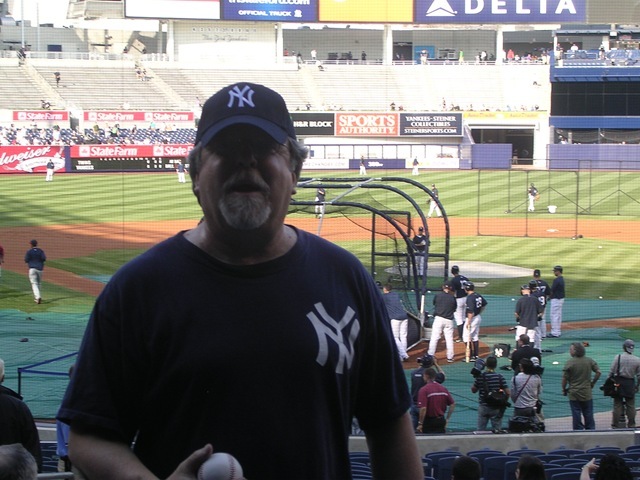 Lucky man caught the ball in the left field seats at Yankee Stadium, reminds me of another catch at another time….but that’s another story. 3,000 hits is a lot of hits. Do the math, it’s 200 hits a year for 15 years. 1. Jeter is the first New York Yankee to reach 3,000 hits, and the first player in history to get his 3,000th hit at Yankee Stadium, old or new. 2. Jeter becomes the first player to go 5-for-5 in the game in which he got his 3.000th hit. Craig Biggio, the last man to join the 3KC before Jeter, went 5-for-6 in 2007. 3. The only other player to reach 3,000 hits with a home run was Wade Boggs, Jeter’s teammate on the 1996 championship team. Boggs hit the milestone homer for the Tampa Bay Devil Rays in 1999. 4. Jeter is the first shortstop to reach 3K since Honus Wagner of the Pittsburgh Pirates in 1914. 5. Jeter is the 28th player to join the 3KC, and the 10th to have played with the same team. The others are Stan Musial, Al Kaline, Roberto Clemente, Carl Yastrzemski, George Brett, Cal Ripken, Robin Yount, Tony Gwynn and Craig Biggio. 6. Other members of the 3KC who played for the Yankees are Paul Waner, Dave Winfield, Wade Boggs and Rickey Henderson. 7. Captain Jeter is the fourth youngest player to reach the 3KC, behind Ty Cobb, Hank Aaron and Robin Yount. 8. Jeter got to 3,000 hits eight days quicker than Pete Rose, the all-time hit leader with 4,256. 9. Having passed Roberto Clemente at 3,000 hits, Jeter is currently 27th on the all-time list. If he remains relatively healthy the rest of the year, he should pass seven players ahead of him — Al Kaline (3,007), Wade Boggs (3,010), Rafael Palmeiro (3,020), Lou Brock (3,023), Rod Carew (3,053), Rickey Henderson (3,055) and Craig Biggio (there’s that man again, 3,060). That would place him 20th on the all-time list, with two years (and a player option for a third) left on his current contract. 10. Jeter got the first hit of his career against Tim Belcher of the Seattle Mariners on May 30, 1995. Who knew then he was on his way to Cooperstown. Before Jose Reyes injured his hamstring last week and went on the DL, he was on pace to accomplish something that hasn’t been done in 99 years — hit 30 triples in a season. Reyes has 15 with nearly half a season to go, but right now it’s unclear when he will return to the Mets lineup. The triple is one of the most exciting plays in baseball, a combination of power and speed. Here are 10 things you may not know about baseball’s three-base hit. 1. John Owen “Chief” Wilson of the Pittsburgh Pirates hit 36 triples in 1912 to lead the National League and set the all-time record for a single season. Nobody has come within 10 triples of that total since. Wilson, a native of Austin, Texas, who also played for the St. Louis Cardinals, never hit more than 14 in any season of his nine-year career. 2. Only two other players have ever hit 30 triples in a season. Dave Orr with the New York Metropolitans of the American Association in 1886 and Heinie Reitz with the Baltimore Orioles of the National League in 1894 each finished with 31 triples. 3. Wahoo Sam Crawford, below right, of the Detroit Tigers is the all-time career leader in triples with 309. The Hall of Famer broke in with the Cincinnati Reds, but played most of his career — and hit most of his triples — for the Detroit Tigers. 4. Three other Hall of Famers — Crawford’s teammate Ty Cobb (297), Honus Wagner(252) and Jake Beckley (244) — rank second, third and fourth in career triples. Cobb is the all-time American League leader in triples, and Wagner the all-time NL champ. 5. In the past 60 years, no player has hit more triples than Curtis Granderson, who had 23 with the 2007 Tigers. 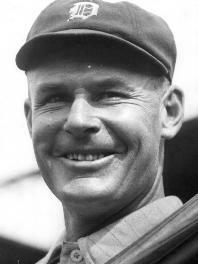 The last player to hit more than 23 was Hall of Famer Kiki Cuyler, with 26 triples in 1925 for the Pittsburgh Pirates. 6. Miguel Tejada of the Oakland A’s holds the record for most at bats in a season without a triple, 662 in 2002. Sammy Sosa of the Cubs holds the National League record with 643 — during a season in which he hit 66 home runs. 7. Four players — including Hall of Famer Willie McCovey of the San Francisco Giants in 1959 — share the record with two triples in their first major league games. Ed Irvin, Ray Weatherly and John Sipin also accomplished the feat. 8. Only two players have hit four triples in a game. George Strief with the Philadelphia Athletics of the American Association in 1885 and Bill Joyce with the New York Giants of the NL in 1897. 9. Sam Crawford and Willie Wilson of the Kansas City Royals each led the AL in triples five times, and Stan Musial of the Cardinals had five triples crowns to lead the NL. Crawford also led the NL in triples once, with the Reds. 10. Shano Collins, who played for the White Sox and Red Sox between 1910 and 1925, holds the record with eight bases-loaded triples. Hall of Famer Stan Musial of the Cardinals hit seven for the NL record.